If you think that because your vehicle is currently running well it is unnecessary to bring it to the auto shop for its factory maintenance, as detailed in the vehicle owner's manual, you're wrong. While your vehicle may be running great now, a few more miles and all of that could change. Here are 5 reasons why you should always keep up with factory auto maintenance, which includes oil changes, fluid flushes, filter replacements and more. As mentioned, you may think that your vehicle is running great now but within a few hundred more miles or so that could all change drastically. Parts don't last forever, so putting off that maintenance could lead to excessive stress on the engine, resulting in a breakdown that leaves you stranded. You may think it is silly to pay to have maintenance performed on a vehicle that is running just fine, but remember, without the services it needs it's eventually going to bite the dust. This will result in a need for repairs to the engine, transmission or other systems due to neglect, and these repairs generally don't come cheap. Routine maintenance ensures that your vehicle is operating at peak performance. This means you are receiving the power you need when you need it, all while achieving the highest possible fuel economy. If your vehicle is under warranty you will need to have these services completed to ensure it remains so. 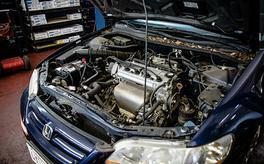 Vehicle neglect is means for terminating a warranty early. The cost of preventative maintenance is generally much less than that of the repairs that will be necessary to fix your car once something goes awry. To keep more cash in your wallet and more gas in the tank always be sure to perform factory maintenance services. When it's time for factory auto maintenance in Palo Alto or the neighboring California communities be sure to reach out to The Car Doctor. Our auto maintenance experts offer dealership alternative service designed to help you get the most out of your vehicle! To learn more or to schedule professional auto maintenance in Palo Alto or Mountain View give us a call at (650) 492-6853 today.